In a mixing bowl, combine flours, cornmeal, oats, and baking powder. In a separate mixing bowl, combine buttermilk, eggs, honey, and vegetable oil until smooth. Add wet ingredients to dry ingredients, stirring until a smooth batter forms. Spray a griddle or skillet with nonstick cooking spray and heat it over medium heat. 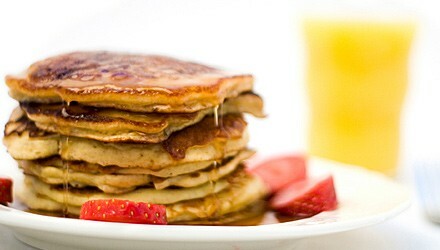 To make pancakes, pour 1/4 cup batter for each pancake onto the hot griddle. When bubbles form and pop, flip each pancake over with a spatula and cook the other side for an additional minute. Repeat until all batter is used. Serve immediately. Exchanges per serving: 3 starch, 1/2 fat. Carbohydrate choices: 3.